How to achieve IMPACT: Know when to carry on! Traditional botanical painting techniques can sometimes lead to pale and washed-out looking subjects. But in real life flowers and fruit so often have a bold, vibrant colour which is what draws us to them in the first place. It’s certainly what made me want to paint them. There’s no doubt that a very bright red or deep purple flower is going to be more impactful when compared to a pale pink flower, or even a green apple. 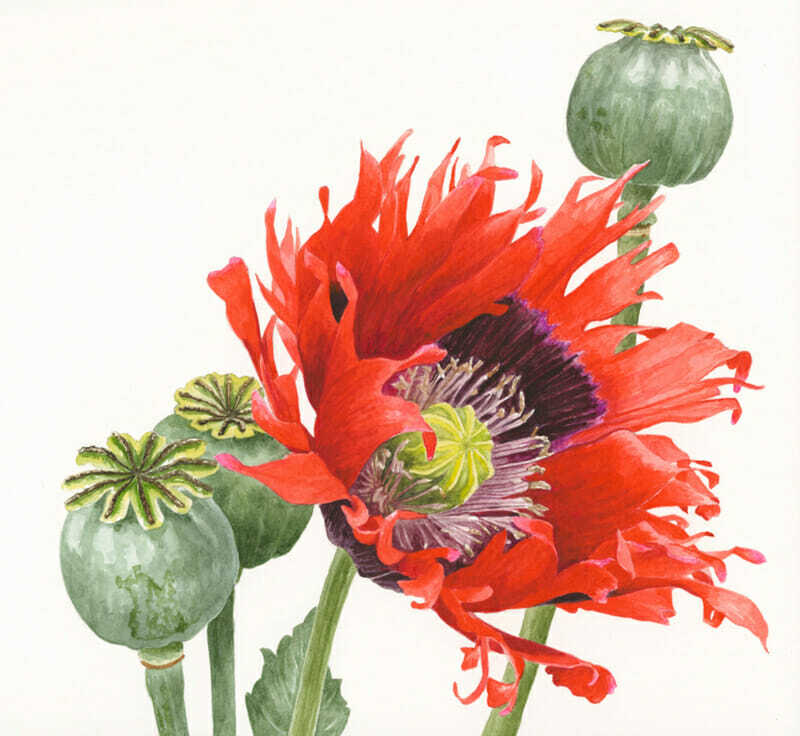 But to me, whatever the colour of the subject, the key to giving any botanical painting maximum impact is to make sure the true depth of colour present in the real subject is captured. I create this depth of colour by working with numerous layers of milky-creamy paint. I always allow each layer to dry before applying the next. I don’t actually wait for this to happen, or break out a hairdryer; I find there’s always another part of the painting to work on whilst this is happening. If you use the most transparent of watercolours in this way, your results won’t muddy and you’ll get some really bold, vibrant results. Have you ever been told that you need to know when to stop? Well for this type of realistic painting, I find that the opposite is true. You need to know when you should carry on! Building up layers to the correct depth of tone is necessarily a gradual process and it can be easy to fall short of the sort of bold depth of colour seen in the real-life subjects. I’m always encouraging my students to add another layer to darken up areas of their compositions for added impact. This poppy is a step-by-step project available in my book ‘The Modern Flower Painter’ and is also available as a full step-by-step video tutorial in my online School.